The new design of ATRIO pays respect to the previous generation, but we’ve elevated the design into a completely new place. At the heart of comfortable, contemporary style is the marriage of quality and style, a harmony of form and function that quietly reassures and which is a joy to use each and every day. 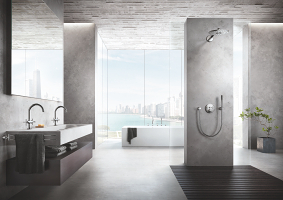 With the new GROHE Atrio collection superlative ease of use and guaranteed longevity come as standard and you can bring the rigor and clarity of the best contemporary architecture right into the heart of your bathroom design. GROHE Atrio is the perfect fit. 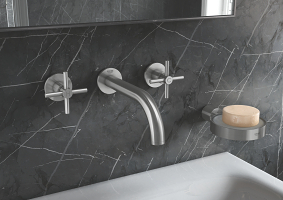 The refined silhouette of the new GROHE Atrio collection brings to the bathroom a timeless quality that accommodates these two key demands. 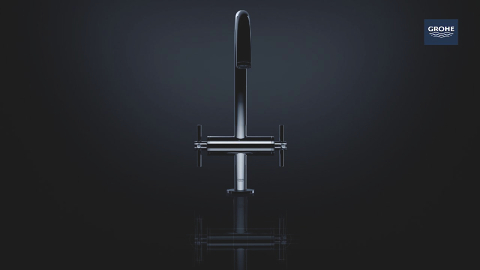 The handcrafted finish and engineering expertise that go into every Atrio tap promise to bring a tangible note of luxury to classic schemes. 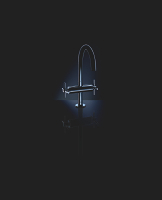 At GROHE we believe that the strongest trends are built to last, and the new GROHE Atrio collection is defined both by its purity and quality. 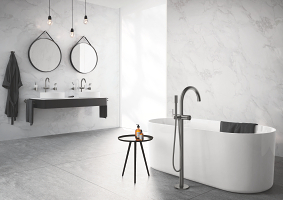 Completely at home in a minimalist setting, the outline of the new Atrio range is breathtaking in its simplicity, presenting a forward-looking aesthetic ideal for making a positive statement in a cosmopolitan bathroom scheme. Based on the most simple, elegant geometric form – the circle – you can be confident that in years to come the Atrio will look as immaculate and relevant to your scheme as it does today. 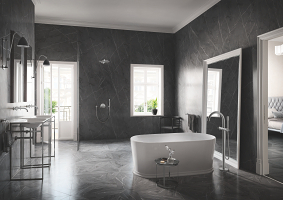 When it comes to perfect bathroom design, the ultimate guide should be your own personal style. 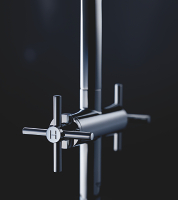 Whether you like a tone-on-tone colour scheme, prefer a harmony of contrasting colours, enjoy seeking out the discrete beauty of brushed nickel or are fascinated by the intriguing elegance of brushed hard graphite, GROHE SPA Colours are the perfect choice. A carefully selected range of colours and finishes will give you many options to complement your interior design. But there is more to it than just the obvious beauty. 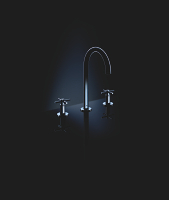 Our new colours come with GROHE PVD quality. This outstanding finish ensures both maximum colour brilliance as well as unparalleled material resistance.